Returns a value indicating if the property is internal. Returns a value indicating if the property is manual. Returns a value indicating if the given parameter is inherited from a parent. Returns a value indicating if the given parameter is hidden. Returns the number of property's parameters. Searches for a parameter by the given name among all parameters of the current property and also among all parameters of the parent property that aren't overridden in the current property. Searches for a parameter by a given name among all parameters of the property. Updates the value of the given parameter. Returns the name of the group, to which the specified property parameter belongs. Returns the filter string associated with the specified property parameter. Returns the title of the specified property parameter. Returns the tooltip of the specified property parameter. Updates the value of the given file parameter. Returns the current value of the given file parameter. Returns a value indicating if the specified file parameter stores a reference to an asset file. Returns a value indicating if the specified file parameter stores a reference to a runtime file. Returns a value indicating if the specified file parameter stores an absolute file path. Returns a value indicating if a file corresponding to the specified file parameter of the property exists. Updates the value of the given material parameter. Returns the current value of the given material parameter. Updates the value of the given property parameter. Returns the current value of the given property parameter. Updates a value of the given color parameter. Returns the current color set for the given color parameter. Updates the value of the given double parameter. Returns the current value of the given double parameter. Returns the maximum allowed value of the given double parameter. Returns the minimum allowed value of the given double parameter. Updates the value of the given float parameter. Returns the current value of the given float parameter. Returns the maximum allowed value of the given float parameter. Returns the minimum allowed value of the given float parameter. Updates the value of the given file, material, or property parameter using the specified GUID. Returns the current value of the given file, material, or property parameter as a GUID of that material, property, or file. Updates the value of the given Node parameter. Returns the current value of the given Node parameter. Updates the value of the given Node parameter by the specified node ID. Updates the value of the given integer parameter. Returns the current value of the given integer parameter. Returns the maximum allowed value of the given integer parameter. Returns the minimum allowed value of the given integer parameter. Updates a value of the given mask parameter. Returns the current value set for the given mask parameter. Returns the name of the given property's parameter name. Returns a value indicating if the given slider parameter of the current property uses a logarithmic scale (with the base ten). Returns a value indicating if the maximum value of the given slider parameter can be increased. Returns a value indicating if the minimum value of the given slider parameter can be decreased. Returns a value indicating if a slider parameter with a given number has the maximum value specified. Returns a value indicating if a slider parameter with a given number has the minimum value specified. Updates the value of the given string parameter. Returns the current value of the given string parameter. Updates the value of the given switch parameter. Returns the current value of the given switch parameter. Returns the value of the item of the given switch parameter. Returns the number of items of the given switch parameter. Updates the value of the given toggle parameter. Returns the current value of the given toggle parameter. Returns the type of the given parameter. Updates the value of the given vector (vec3) parameter. Returns the current value of the given vector (vec3) parameter. Updates the value of the given vector (vec4) parameter. Returns the current value of the given vector (vec4) parameter. Resets the overriden value of the given parameter to the parent's value. RESTORE_MODE_REPLACE Restore mode, which replaces all parameter values. int num - Parameter number in range from 0 to the total number of the property parameters (including parameters of its parent; if a parameter of the current property overrides the parent property's parameter, the parent property's parameter isn't taken into account). New parameters are added to the end of the parameters list. 1 if the given parameter is inherited from a parent; otherwise, 0. 1 if the given parameter is hidden; otherwise, 0.
const char * name - Name of the parameter. The number of the parameter, if it is found; otherwise, -1.
int fast_id - Parameter number in users auxiliary parameters cache. The value must be in the range [0; 128]. const Variable & value - New value of the parameter. Returns the name of the group, to which the specified property parameter belongs. Property parameters are displayed in groups in the Parameters window of the UnigineEditor. Name of the group to which the specified property parameter belongs. Returns the filter string associated with the specified property parameter. 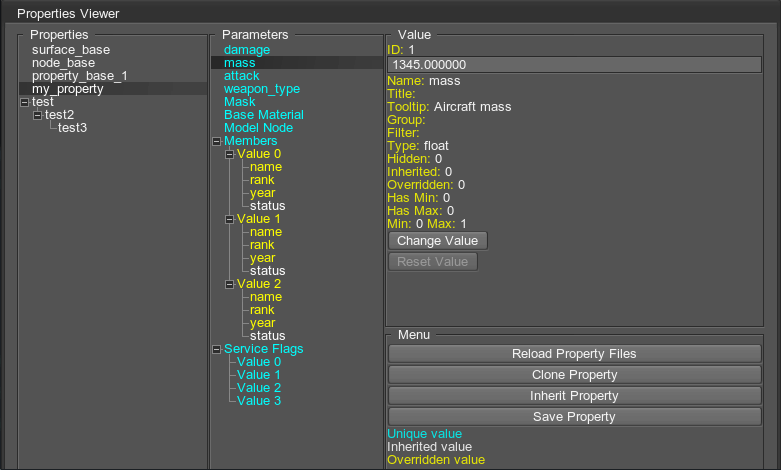 This string specifies a filter for file, material or property parameter values thet will be used in the UnigineEditor. For example, you can specify ".xml|.node|.txt" to filter certain types of assets, or specify a base material to filter out materials, that cannot be used in a particular case (e.g. to avoid an attempt of assigning a post material to a mesh). Returns the title of the specified property parameter. This title is displayed in the UnigineEditor's UI. Title of the specified property parameter. Returns the tooltip of the specified property parameter. This tooltip is displayed in the UnigineEditor, when user hovers a mouse over the property field. Tooltip text of the specified property parameter. Updates the value of the given file parameter. If the property is not editable, the value won't be updated. const char * value - New value for the file parameter. int num - Parameter number in range from 0 to the total number of the property parameters (including parameters of its parent; if a parameter of the current property overrides the parent property's parameter, the parent property's parameter isn't taken into account). New parameters are added to the end of the parameters list. An index in users auxiliary parameters cache can laso be specified, in this case the fast flag should be set to 1. To get a GUID of the file, use the getParameterGUID() method. 1 if the specified file parameter stores a reference to an asset file; otherwise, 0. 1 if the specified file parameter stores a reference to a runtime file; otherwise, 0. 1 if the specified file parameter stores an absolute file path; otherwise, 0. 1 if a file corresponding to the specified property parameter exists; otherwise, 0. Updates the value of the given material parameter. If the PARAMETER_MATERIAL variable isn't set for the parameter, or the property is not editable, the value won't be updated. const Ptr<Material> & value - Material smart pointer to be set as a value of the specified parameter. Returns the current value of the given material parameter. If the PARAMETER_MATERIAL variable isn't set for the parameter, the function will return NULL. Material smart pointer currently set as a value of the specified parameter. Updates the value of the given property parameter. If the PARAMETER_PROPERTY variable isn't set for the parameter, or the property is not editable, the value won't be updated. const Ptr<Property> & value - Property smart pointer to be set as a value of the specified parameter. Returns the current value of the given property parameter. If the PARAMETER_PROPERTY variable isn't set for the parameter, the function will return NULL. Property smart pointer currently set as a value of the specified parameter. Updates a value of the given color parameter. If the PARAMETER_COLOR variable isn't set for the parameter, the color value won't be updated. const Math::vec4 & value - New value for the color parameter. Returns the current color set for the given color parameter. If the PARAMETER_COLOR variable isn't set for the parameter, the function will return (0,0,0,0). Color value of the color parameter. If an error occurs, (0,0,0,0) will be returned. Updates the value of the given double parameter. If the PARAMETER_DOUBLE variable isn't set for the parameter, or the property is not editable, the value won't be updated. double value - New value for the double parameter. Returns the current value of the given double parameter. If the PARAMETER_DOUBLE variable isn't set for the parameter, the function will return 0.0f. Value of the douuble parameter. Returns the maximum allowed value of the given double parameter. If the PARAMETER_DOUBLE variable isn't set for the parameter, the function will return 1.0f. Maximum allowed value of the double parameter. Returns the minimum allowed value of the given double parameter. If the PARAMETER_DOUBLE variable isn't set for the parameter, the function will return 0.0f. Minimum allowed value for the double parameter. Updates the value of the given float parameter. If the PARAMETER_FLOAT variable isn't set for the parameter, or the property is not editable, the value won't be updated. float value - New value of the float parameter. Returns the current value of the given float parameter. If the PARAMETER_FLOAT variable isn't set for the parameter, the function will return 0.0f. Value of the float parameter. Returns the maximum allowed value of the given float parameter. If the PARAMETER_FLOAT variable isn't set for the parameter, the function will return 1.0f. Maximum allowed value of the float parameter. Returns the minimum allowed value of the given float parameter. If the PARAMETER_FLOAT variable isn't set for the parameter, the function will return 0.0f. Minimum allowed value of the float parameter. Updates the value of the given file, material, or property parameter using the specified GUID. If the property is not editable, the value won't be updated. const UGUID & value - New GUID value for the specified parameter. Returns the current value of the given file, material, or property parameter as a GUID (i.e. a GUID of a material, a property or a file will be returned). Value of the specified parameter as a GUID. Updates the value of the given Node parameter. If the PARAMETER_NODE variable isn't set for the parameter, or the property is not editable, the value won't be updated. const Ptr<Node> & value - Node smart pointer to be set as a value of the specified parameter. Returns the current value of the given Node parameter. If the PARAMETER_NODE variable isn't set for the parameter, the function will return NULL. Node smart pointer currently set as a value of the specified parameter. Updates the value of the given Node parameter by the specified node ID. If the PARAMETER_NODE variable isn't set for the parameter, or the property is not editable, the value won't be updated. int value - ID of a node to be set as a value of the specified parameter. Returns the current value of the given Node parameter. If the PROPERTY_PARAMETER_NODE variable isn't set for the parameter, the function will return 0. ID of a node currently set as a value of the specified parameter. Updates the value of the given integer parameter. If the PARAMETER_INT variable isn't set for the parameter, or the property is not editable, the value won't be updated. int value - New value for the integer parameter. Returns the current value of the given integer parameter. If the PARAMETER_INT variable isn't set for the parameter, the function will return 0. Value of the integer parameter. Returns the maximum allowed value of the given integer parameter. If the PARAMETER_INT variable isn't set for the parameter, the function will return 1. Maximum allowed value of the integer parameter. Returns the minimum allowed value of the given integer parameter. If the PARAMETER_INT variable isn't set for the parameter, the function will return 0. Minimum allowed value of the integer parameter. Updates a value of the given mask parameter. If the PARAMETER_MASK variable isn't set for the parameter, or the property is not editable, the value won't be updated. int value - New value for the mask parameter. Returns the current value set for the given mask parameter. If the PARAMETER_MASK variable isn't set for the parameter, the function will return 0. Value of the mask parameter. If an error occurs, 0 will be returned. int num - The number of the target parameter in range from 0 to the total number of the property parameters (including parameters of its parent; if a parameter of the current property overrides the parent property's parameter, the parent property's parameter isn't taken into account). Returns a value indicating if the given slider parameter of the current property uses a logarithmic scale (with the base ten). The slider parameter is a parameter of one of the following types: PARAMETER_INT, PARAMETER_FLOAT, PARAMETER_DOUBLE. int num - The number of the slider parameter in range from 0 to the total number of the property's parameters (including parameters of its parent; if a parameter of the current property overrides the parent property's parameter, the parent property's parameter isn't taken into account). 1 if the parameter uses a logarithmic scale; otherwise, 0. Returns a value indicating if the maximum value of the given slider parameter can be increased. The slider parameter is a parameter of one of the following types: PARAMETER_INT, PARAMETER_FLOAT, PARAMETER_DOUBLE. Returns a value indicating if the minimum value of the given slider parameter can be decreased. The slider parameter is a parameter of one of the following types: PARAMETER_INT, PARAMETER_FLOAT, PARAMETER_DOUBLE. 1 if a slider parameter with a given number has the maximum value specified; otherwise, 0. 1 if a slider parameter with a given number has the minimum value specified; otherwise, 0. Updates the value of the given string parameter. If the PARAMETER_STRING variable isn't set for the parameter, or the property is not editable, the value won't be updated. const char * value - New value for the string parameter. Returns the current value of the given string parameter. If the PARAMETER_STRING variable isn't set for the parameter, the function will return NULL. Value of the string parameter. Updates the value of the given switch parameter. If the PARAMETER_SWITCH variable isn't set for the parameter, or the property is not editable, the value won't be updated. int value - New value for the switch parameter. Returns the current value of the given switch parameter. If the PARAMETER_SWITCH variable isn't set for the parameter, the function will return 0. Returns the value of the item of the given switch parameter. If the PARAMETER_SWITCH variable isn't set for the parameter, the function will return NULL. Returns the number of items of the given switch parameter. If the PARAMETER_SWITCH variable isn't set for the parameter, the function will return 0. Updates the value of the given toggle parameter. If the PARAMETER_TOGGLE variable isn't set for the parameter, or the property is not editable, the value won't be updated. Returns the current value of the given toggle parameter. If the PARAMETER_TOGGLE variable isn't set for the parameter, the function will return 0. Updates the value of the given vector (vec3) parameter. If the PARAMETER_VEC3 variable isn't set for the parameter, or the property is not editable, the value won't be updated. const Math::vec3 & value - New value for the vector (vec3) parameter. Returns the current value of the given vector (vec3) parameter. If the PARAMETER_VEC3 variable isn't set for the parameter, the function will return (0,0,0). Value of the vector (vec3) parameter. Updates the value of the given vector (vec4) parameter. If the PARAMETER_VEC4 variable isn't set for the parameter, or the property is not editable, the value won't be updated. const Math::vec4 & value - New value for the vector (vec4) parameter. Returns the current value of the given vector (vec4) parameter. If the PARAMETER_VEC4 variable isn't set for the parameter, the function will return (0,0,0,0). Value of the vector (vec4) parameter.